First, I wanna make sure that you all know that Harajuku is a big area, where Meiji Shrine, Yoyogi Park, Takeshita Doori, Omotesando, etc are part of this area, so there are lots of places to come by here. 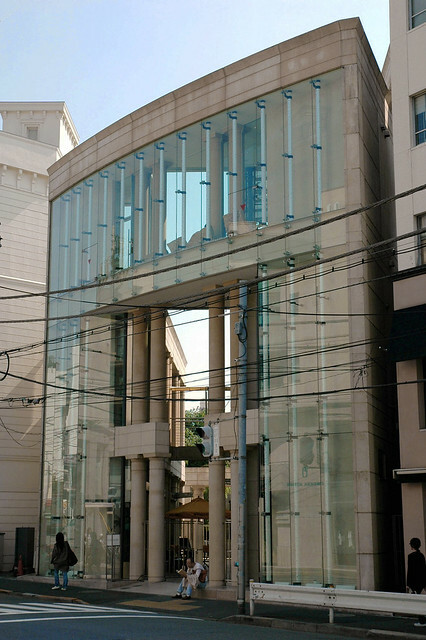 Secondly, I wanna tell you that most of the clothing stores in Harajuku, including the famous brands, are in form of small stores or located on the second-floor of a building, sharing with the other store. Third, most of the street wear brand store are located on small and narrow streets, some are hidden on smaller and narrower streets, so you have to explore each alley to look for your favourite store, but that’s the interesting part for me. I suggest you guys to bring your phone or anything so you can use GPS to save your time by tracking your own location and the stores location. 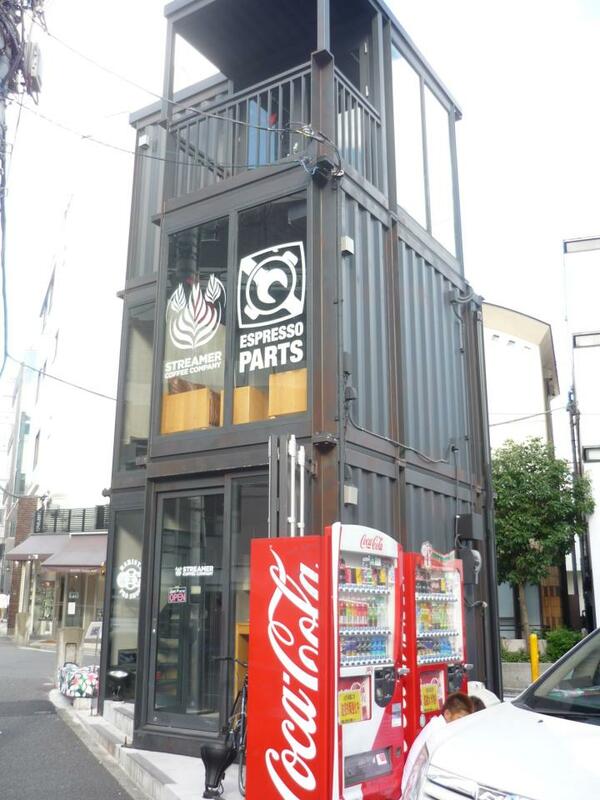 So in Harajuku, you can’t really expect your favourite brand will have a big store and located in the main street. 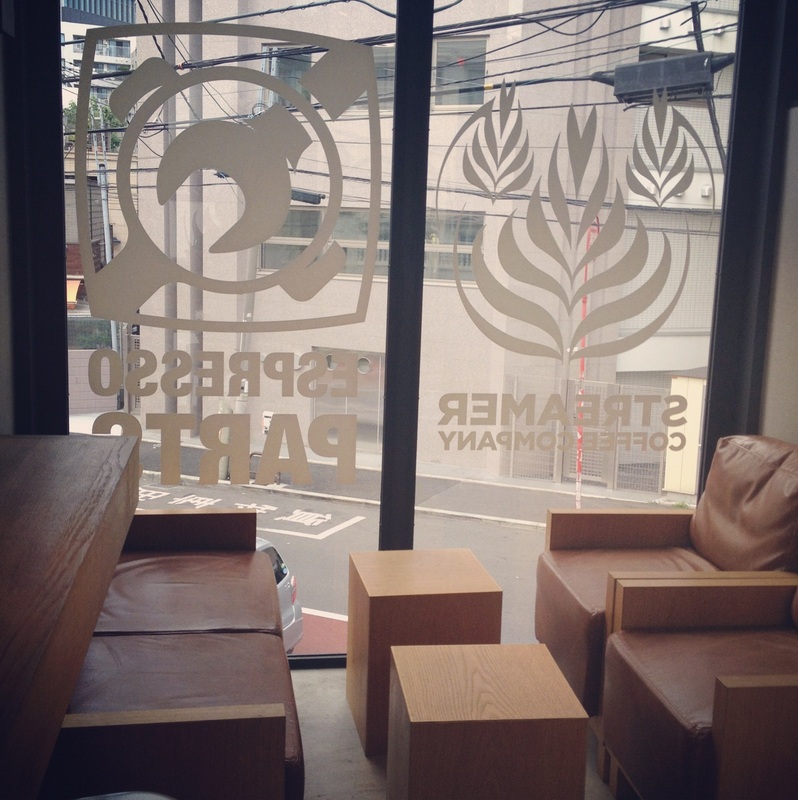 After I went out from the crowded Takeshita Doori, I went to look for the next place in my destination list, which is the Streamer Coffee Company. Since my ipod couldn’t use wi-fi, I didn’t really know where exactly that coffee shop is, I just saw it on google map at home before I left that it’s located on the north side of Harajuku. While I was searching for the Streamer Coffee Company, I also take this chance to looked for the stores of my favourite brands. Let’s see what I found.. The first store that I went to was Neighborhood store. This biker style clothing store really has its own concept with the bikes that were placed in front of the store and inside the store and the vintage interior as well. This brand is a must for those who like to dressed up like bikers. On the left side of this Neighborhood store, there is stairs leading to the second floor of the building. If you climb the stairs to the second floor you will find another super street wear brand which is no other than Supreme. This Supreme store is located right above the Neighborhood store. The design of the store is really simple and everything were nicely placed. For those who love this street wear brand, going to this store is a must since you can have the Supreme goods with its original price. Moreover, if you’re lucky, like me, you can find a discount for some of the goods here. Moving on to the north, to the main street, I walk trough this Beams store. Actually there were some of Beams stores lined up on the main street, including Beams T and International Gallery of Beams. 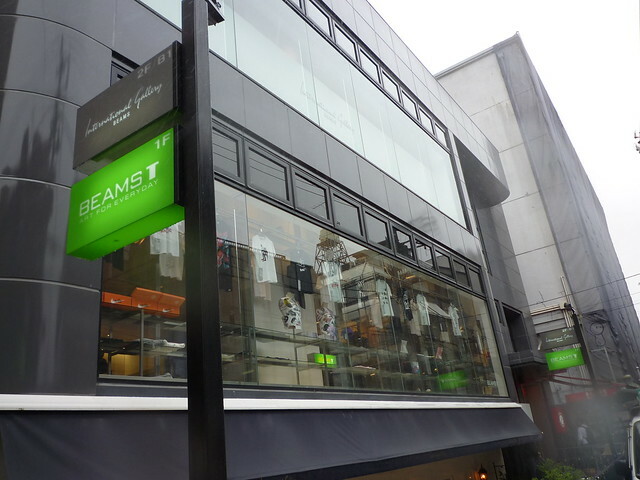 Since I had been to the Beams store in Shibuya, I just took a slight look inside this Harajuku Beams store.. Finally, after a few more walk to the north I found the coffee shop that I was looking for, the Streamer Coffee Company! Actually, I knew this coffee shop from a blog and I was interested with the design of the places that were really simple and unique. Moreover, the owner of Streamer Coffee Company, Hiroshi Sawada, was the first Asian to become the world champion at the “2008 Free Pour Latte Art Championships” held in Seattle, U.S.A. Therefore, I put this cool coffee shop into my destination list. 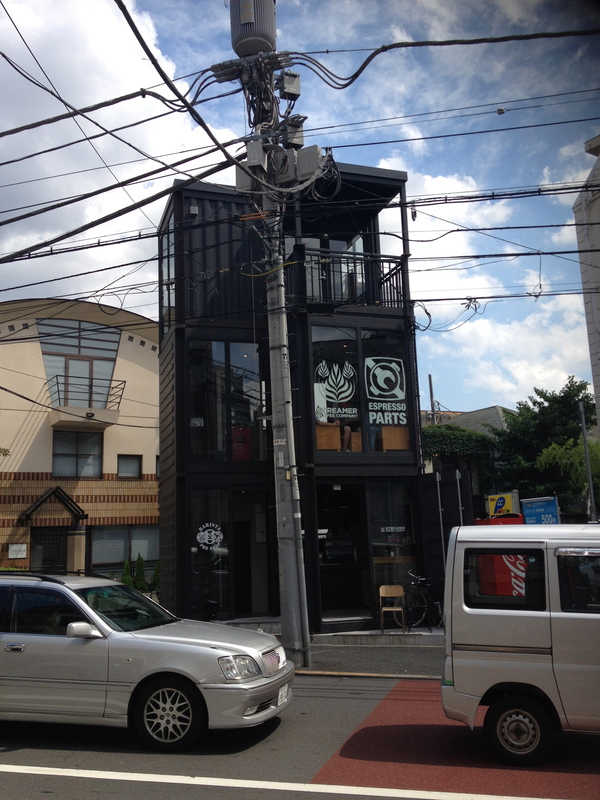 In that picture above is the very building of the Streamer Coffee Company in Harajuku. The building really stands out compared to the other buildings in the neighbourhood. Since it was in the noon of a blazing Summer day, which was super hot, coming to have a cold coffee inside this dashing place was a best choice. I came in to the right room to order the coffee first, after that I brought the coffee to the second floors through the door on the left side. 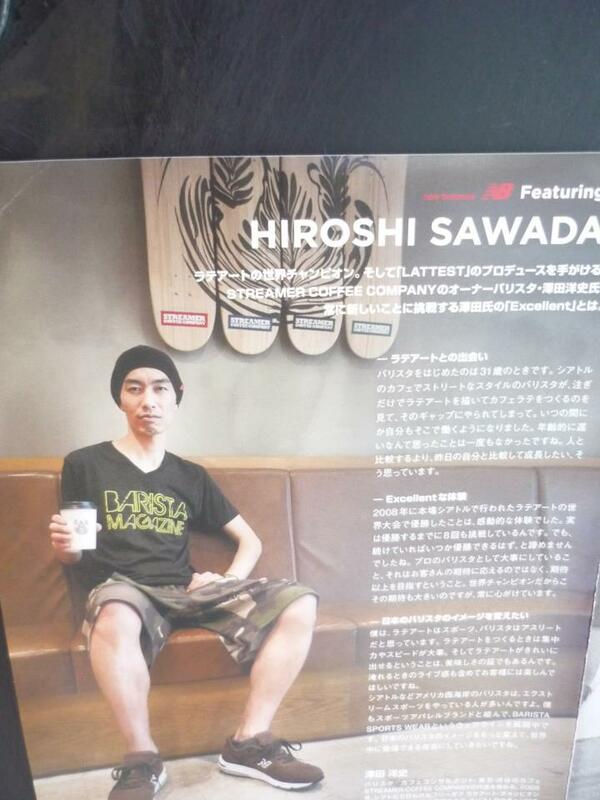 Oh yeah, when I was ordering the coffee I saw a poster of Sawada-san, the owner, on the news board. Here’s the picture.. Looked like there was a kind of collaboration between Sawada-san with New Balance. What makes the Streamer Coffee Company different compared to the other coffee shops is that this coffee shop really has its own stay and concept, feels like the Streamer Coffee Company serves more than just a cup of coffee. Though the place was not really wide, only for eight persons if I’m not mistaken, that place was one of the coolest coffee shops I’ve ever been to. Don’t forget that the coffee was great too! After had a nice cup of cold coffee and rest for a while, I had become more than ready to explore the whole area of Harajuku again. The next amazing store that I went trough was United Arrows Harajuku. This store was really amazing, big building, elegant design, and has very friendly staffs, just perfect. In my opinion, there was not a better store in Harajuku than this United Arrows. When I was there, I found lots of collection of brands, from the casual brand Beauty and Youth to the formal one United Arrows and Sons. 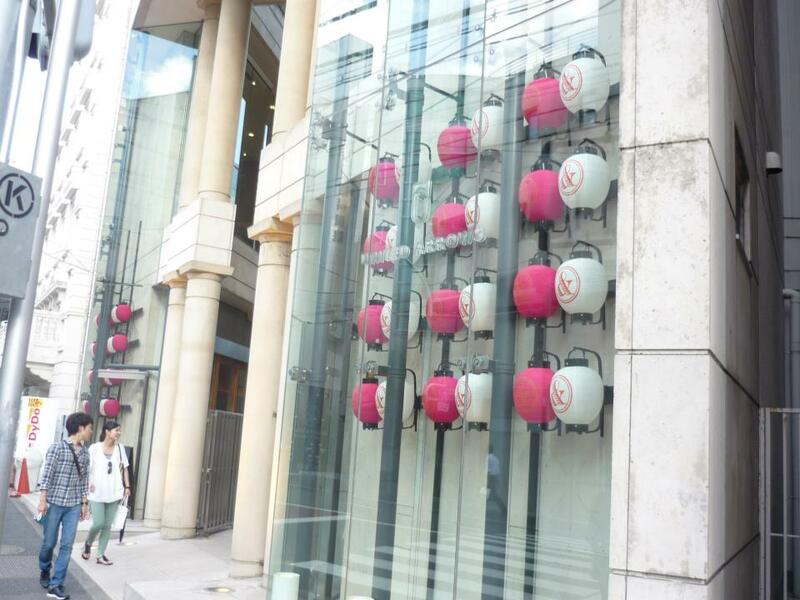 This store consists of several floors, each floor is dedicated for each brand. 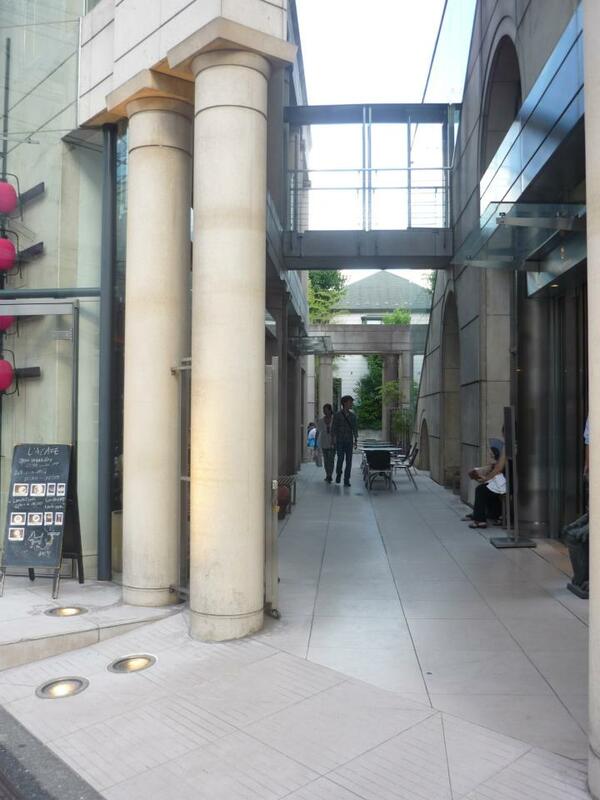 The building itself was separated into two buildings, the right one was the store and the left one was the United Arrows Cafe. I was just looking around the store and I went to the highest floor unnoticed that the highest floor was for the collection of formal menswear (suits), which was not for me. Unfortunately, the staff on that floor recognized my presence and greeted me, then I just told him that I came to a wrong floor. :D However, though I was mistakenly came to that high-end executive men’s section, the staff kindly told me to go down using the elevator. I was really dazzled with that kind of treatment from the staff that really respect all of the customers, though some of them buy nothing like me. I guess we can only find that kind of service only in Japan and that is exactly one of the reason I really love Japan, always working whole-heartedly. 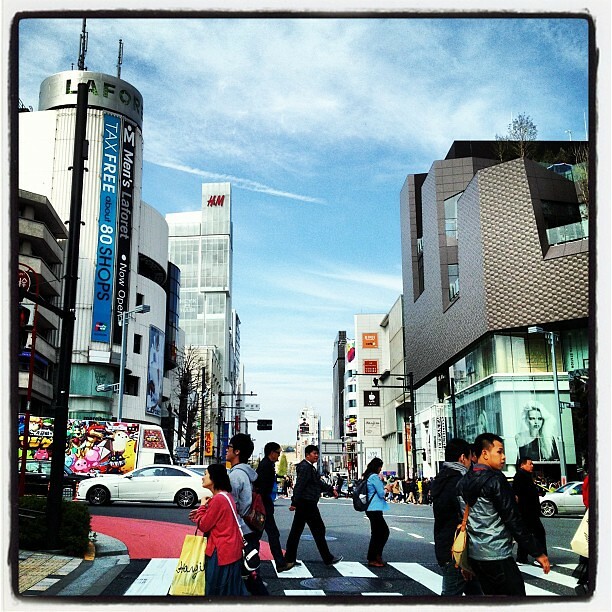 After being amazed by the staff of the United Arrows, I continued my journey in this shopping complex of Harajuku..